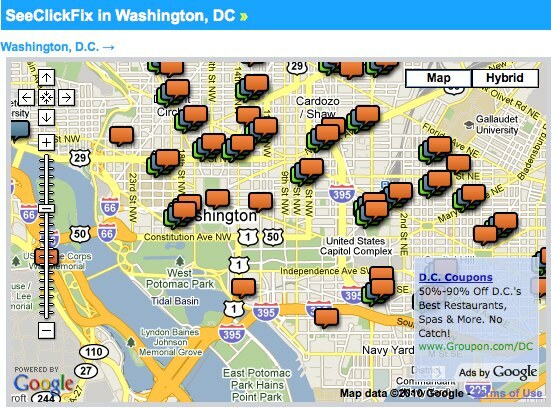 A screenshot of the SeeClickFix widget on TheCityFix DC. Last week, our friends at SeeClickFix announced the mapping tool’s integration with Washington D.C.’s new Open311 API. or the smart phone app, available for Android, Blackberry, and iPhone. Open311 is not meant to refer to a specific app or any one incarnation of 311 services. Instead Open311 intends to be a specification of an open platform for 311 services. This difference may seem subtle, but it’s an important one. It’s the difference between closed platforms like the iPhone and open platforms like Android or the web which are enabled by open standards: the Android operating system, HTML, and HTTP. The challenge we need to address is creating an open standard by looking at APIs like those offered by D.C. and SeeClickFix and coordinating the commonalities of different city infrastructure to distill core requirements for a universal 311 API. Once this core standard is defined, new user interfaces and custom workflows can be created by anyone and shared between cities to provide distributed innovation. You can keep tabs on D.C. open APIs here: https://api.dc.gov/. Currently, there are three APIs in “beta” mode: Service Requests/311, Geocoding and DC Circulator.